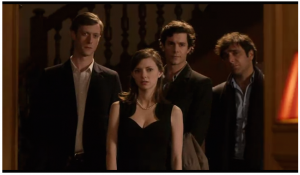 Here are some excellent new articles on Whit Stillman’s Amazon show The Cosmopolitans. The Cosmopolitans hits on familiar themes that should charm Stillman fans. There’s even a callback to the Sambola, which Greta Gerwig’s Violet was so determined to make an international dance craze in Damsels in Distress. Yet, the real gem is Carrie MacLemore as she dissects everything she sees with a precise, inscrutable nature mixed with naivety. It’s always fascinating to just watch what her face is doing. The pilot is witty, insightful, biting, and arguably has the most to say out of any of the current Amazon offerings. The dialogue just flows, making The Cosmopolitans a comfort to be around. As with his features, Stillman lets his characters indulge in ultra-white-people problems while gently chuckling at them for it. Screen caps from the show. Steve ‘Frosty’ Weintraub at Collider interviews Whit Stillman about his new show, the outlook on the possibility of a Barcelona Blu-ray and the status of his Jane Austen film titled, Love and Friendship. Then they get comedy executives Joe Lewis and Sara Babineau and they are talking to me about doing a series or something and they have the idea that they want to something in Paris and they called me. They called me last summer in July. They wanted to do something in Paris. I think they had some property they were thinking of buying or optioning and having me rewrite it and I said, “I have so many stories in Paris.” I’ve forever been pitching these stories in the states and they’d say they’d never do something abroad, I have to change all the characters to be in New York. So I was doing all these Paris stories in New York – not all of them, but I’d had one. I read a previous interview with you and you said that you envision this as six episodes if it goes. STILLMAN: I thought it was going to be more, I thought they were going to want to see ten episodes – this pilot, plus nine. I’m not sure if it’s just for planning the series bible, or if they want know six episodes ahead, or if it’s only a six episode order. I think it might just be a six episode order, which would be ideal because I could potentially write the whole thing and fine tune it. So I kind of like the idea of six episodes. It’s like a very long film in chapters. So you definitely landed financing or is it still being figured out? STILLMAN: I’m trying to get a little more money and I have a lot of friend types that have always said they know people that want to put money into one of my films and they’re now talking to those people. So I’ll see if those people come in or if we get a little bit more money from someone else. We have enough to shoot it, but I’d like to scale up a little bit and not scale back. We’re doing it really economically already. I think it’s an incredibly good deal for investors, because we’re going to do a really good Jane Austen period film for very little money and it will look beautiful because the locations are beautiful, the actresses are beautiful, and digital cameras are beautiful [laughs]. Carrie MacLemore plays Southern Belle Aubrey in Whit Stillman’s new witty Amazon pilot The Cosmopolitans. MacLemore played Heather in Stillman’s film Damsels in Distress. Makes her feature film debut in Damsels in Distress. Previously, she made guest appearances on Gossip Girl, Law & Order: Special Victims Unit, and The Guiding Light. Originally from Mississippi, and later, Alabama, MacLemore has studied acting at New York’s T. Schreiber Studio with Peter Miner, the Endeavor Studio, Upright Citizens Brigade, and at the London Academy of Music and Dramatic Art. MacLemore was a scene stealer in Damsels in Distress and we look forward to seeing her in more episodes of The Cosmopolitans and other projects. Doree Shafrir at Buzzfeed wrote this funny (the official Cosmos page says so too) article about Whit Stillmanˈs upcoming (premiering tomorrow!) pilot, The Cosmopolitans. Okay, enough with the parentheses…enjoy.